Valery V. Tuchin, PhD, holds the Optics and Biophotonics Chair and is a Director of Research-Educational Institute of Optics and Biophotonics at Saratov State University, Head of Laboratory on Laser Diagnostics of Technical and Living Systems, Inst. of Precise Mechanics and Control, RAS. His research interests include biophotonics, biomedical optics and laser medicine, physics of optical and laser measurements. He has authored more than 300 peer-reviewed papers and books. He has been awarded Honored Science Worker of the Russian Federation and SPIE Fellow; he is a Vice-President of Russian Photobiology Society. In 2007 he was awarded the SPIE Educator Award. 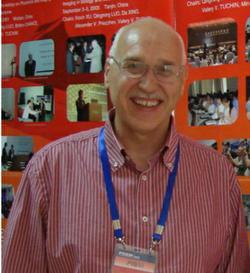 He is a FiDiPro Professor of University of Oulu (Finland).